Clearing invasive plants calls for long-term investment and planning, spanning at least a decade, and often more. A decade ago, the Cape Town municipality allocated several million rand to start the process of clearing alien pine and wattle trees growing across about 50,000 ha of the mountainous water catchments around the site of the new Berg River Dam, about 80 km from the city. The money came from the municipality’s coffers and was paid to the state-owned Trans-Caledon Tunnel Authority (TCTA), which was building the dam, and had to manage a five-year catchment clearing programme. But the job was not finished. Once the dam was done, the TCTA withdrew from the site and abandoned the clearing process after about two years, leaving the unspent money unaccounted for. The land surrounding the dam is state-owned, and according to the Biodiversity Act the state is responsible for clearing the aliens and restoring its catchments. But while the funds in question came from a local government authority (the City of Cape Town) and should have been spent by a national government agency (the TCTA), it was the provincial authority (the Western Cape’s CapeNature) that had to administer the physical clearing of the protected area. The Berg River case highlights how complicated it can be to pay for, administer, and manage the kind of catchment restoration that is currently being mooted in the Western Cape, following the three-year drought which nearly shut off the city’s water supply last summer. Running this kind of project involves roping in institutions from three tiers of government, navigating the different laws and policies governing each of them, and relying on the political will across all sectors to make projects happen, according to environmental consultant Mark Botha. 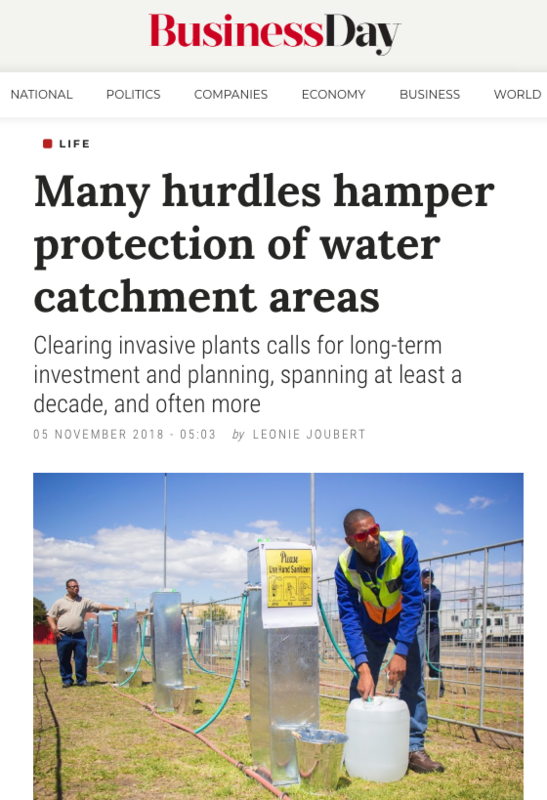 Botha recently surveyed the institutional and policy issues which influence investment in ecological infrastructure restoration in the province’s catchments. This comes ahead of the launch this November of an initiative by the international conservation organisation The Nature Conservancy (TNC), that will help fundraise and oversee the clearing and restoration of the primary catchments around the city’s four main dams by pulling together different government institutions and budgets, as well as civil society organisations and private sector funders. These catchments lose about two months’ supply of water each year to wild-growing invasive trees and farmed commercial plantations, according to a Council for Scientific and Industrial Research (CSIR) calculation. At the height of the city’s 2018 water restrictions, when the goal was to limit collective water use to 500-million litres per day, the CSIR estimated these trees were using 69 days’ worth of water annually. Analysis, by resource economist Jane Turpie from Anchor Environmental Consultants, found that an investment in clearing and restoring the city’s primary catchments will yield water at a cheaper rate than hard-engineered solutions such as building dams, installing desalination plants, or drilling boreholes, which are all part of Cape Town’s water security strategy. According to Turpie, clearing these catchments “should be given high priority”. Cape Town has indicated its willingness to invest in catchment restoration around its main dams as part of a broader approach to shoring up its water resources, but funding issues limit state efforts to tackle invasive plants in all of its protected areas. Since the TCTA’s clearing efforts in the Berg River catchment stalled in 2009, CapeNature has continued the alien clearing, with the Cape Winelands district municipality doing the on-the-ground work, according to CapeNature executive director of conservation management Gail Cleaver-Christie. But the money to pay for this comes primarily from the department of environmental affairs’ natural resource nanagement budget, and is not enough to make decent headway against the continued encroachment. The job is expensive because of the cost of the skilled teams and equipment needed to do technically difficult, high-altitude clearing in the surrounding mountains. Another hurdle is the political will to drive investment in ecological infrastructure, according to Botha and Cleaver-Christie. Clearing invasive plants calls for long-term investment and planning, spanning at least a decade, and often more. The returns are often slower than those from engineered solutions, like installing boreholes or desalination plants, which can come on-stream in two or three years. This makes engineered solutions politically appetising, even though they are more expensive, as Turpie’s analysis shows. Managing these programmes needs to be more agile than government process allow for. If a fire sweeps through a recently cleared area, it will trigger fast regrowth of seedlings. Clearing teams have to be sent in quickly to stop this regrowth, something which state tender processes and short contract periods are not flexible enough to allow for, according to both Cleaver-Christie and Botha. The TNC initiative will rally funding for catchment restoration from state and private sector partners, and oversee how the catchment management is planned, implemented, and paid. In terms of the city’s contribution to funding this kind of work, Botha says it could boost its budget by earmarking a small part of the water tariff, which currently does not include the cost of rehabilitating catchments. The next hurdle, though, is that this money must be spent in areas outside the city’s municipal boundary, or channelled through other state bodies. In the Berg River case, CapeNature still oversees the clearing, while the Cape Winelands district municipality does the work itself. This kind of institutional challenge to rolling out catchment management is a hurdle across the province. Cleaver-Christie says that many different government departments are willing to meet their clearing mandates, but they are working in isolation and “could benefit from one overarching catchment strategy” where their investments are pooled, and their planning and implementation are better co-ordinated. This is where a civil society partner could come in, she says. Co-ordination has already begun to help pull together various state, civil society and private sector bodies, so there can be a more co-ordinated response to restoring and managing the priority catchments feeding into Cape Town’s four main dams, including the Berg River Dam, according to TNC’s SA director Louise Stafford. "The objective isn’t to take over the work of existing institutions," says Stafford, "but rather to find ways to allow them to achieve catchment restoration more effectively". Cape Town is not the only city facing the funding and institutional hurdles that limit its efforts to protect and manage the ecological infrastructure that its economy depends on, according to Botha. Municipalities such as Nelson Mandela Bay, Buffalo City and many in KwaZulu-Natal will “lose the water security battle” if they are not able to close the loop between water revenue collection, and investment in restoring catchments outside of their boundaries.